Rajinikanth makes another donation of Rs 10 Crore! SRK donates Rs 1Crore!! Readers are aware no sooner the news about Chennai Floods gripped the nation, Super star Rajinikanth was the first film star to donate Rs 10 Lakh to the Chief Minister’s Relief fund to help people severely affected by Chennai floods. However it seems after the heartrending news report of a pregnant woman stuck for many days in her house eventually rescued by Indian Air Force from her roof top has moved Rajinikanth. Officially the donation is being kept a low profile as the superstar does not want to make hullabaloo about his charity. Nevertheless reports claim the donation has been made particularly to help pregnant women, who are in dire consequences and do not have medical facilities due to flood conditions. Meanwhile Bollywood Superstar Shah Rukh silenced his critics by munificently donating a massive sum of Rs 1 Crore for the Chief Minister’s Public Relief Fund for the Chennai deluge victims on behalf of Red Chillies Entertainment and team DILWALE. Readers may remember, stanch Hindu Sadhvi Prachi, who terms SRK as a 'Pakistani Agent', in a venom spewing speech at a Vishwa Hindu Parishad function in Muzaffarnagar, recently quoted, “Shah Rukh Khan made hundreds of crores from the movie CHENNAI EXPRESS. Now when Chennai people are struggling for life, where is Mr. Shah Rukh Khan? Sleeping in the comfort of his bungalow when the Chennai city is submerged under water? 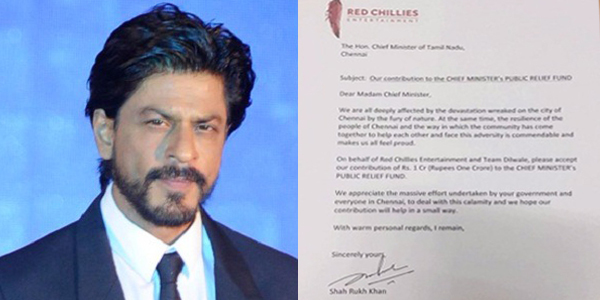 In letter written on his home production Red Chilies Production’s letterhead, SRK pleaded Tamil Nadu Chief Minister J Jayalalithaa, to accept his generous contribution.